Emil Wolf, Wilson Professor of Optical Physics at the University of Rochester, has been named the 2010 SPIE (International Society for Optical Engineering) recipient of the G. G. Stokes Award. The annual prize recognizes exceptional contributions to the field of optical polarization. The author of 423 scientific papers, Professor Wolf is perhaps most well known for his classic book Principles of Optics: Electromagnetic Theory of Propagation, Interference and Diffraction of Light, which he wrote with Nobel Laureate Max Born. This book was first published in 1959 and is now in its seventh edition, which was published by Cambridge University Press in 1999. 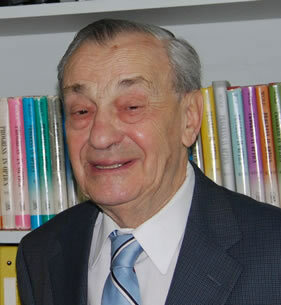 Professor Wolf is the recipient of numerous awards for his scientific contributions and is an honorary member of the Optical Society of America, of which he was the President in 1978. He is also an honorary member of the Optical Societies of India and Australia and is the recipient of seven honorary degrees from Universities in the Netherlands, Great Britain, the Czech Republic, Canada, France and Denmark.